The BCAM Hall of Fame and Hall of Honor plaques have been completely overhauled. They are located on the second floor of the MHSAA Building in East Lansing. Check them out if you are ever at the MHSAA. 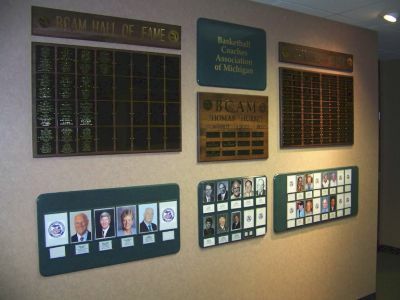 The BCAM Hall of Fame inducted the first members in 1985. The purpose was to honor those coaches who had been successful for many years. There are now over 140 coaches in the BCAM Hall of Fame. To qualify for the Hall of Fame a coach must have coached Varsity/College Head Basketball for 20 years or more and/or accumulated 300 or more victories. Applicants must also have been a BCAM member for a minumum of 5 years during his/her coaching tenure. To nominate a coach for the BCAM Hall of Fame, print a nomination form which will be found under FORMS.